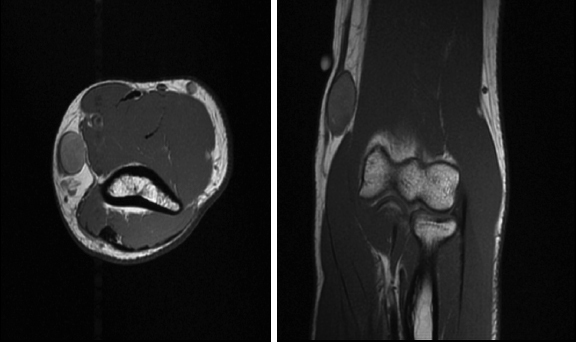 A previously healthy 17-year-old male presented for evaluation of a left medial elbow soft tissue mass with associated burning radiating pain down into his volar forearm. He had reported slight increase in size of the mass over the past couple of months. The patient was initially evaluated by ultrasound and then by MRI. Patient underwent total surgical excision of the mass, which was submitted for histopathological evaluation. Pathology identified the mass as a 3.0 × 1.7 × 1.5 cm high-grade tumor with negative surgical margins that was surrounded by an intact capsule measuring less than 0.1 cm. Immunohistochemistry revealed S-100 protein, which was diffusely and strongly positive. To establish a wide negative margin, the patient underwent tumor bed re-excision. An ultrasound of the soft tissue mass was performed. Longitudinal and transverse-oriented images demonstrated a solid heterogeneous ovoid mass in the medial forearm measuring 29 × 17 × 15 mm with no evidence of internal flow and mild posterior acoustic enhancement. The mass was well circumscribed and appeared to respect the soft tissue planes (Figure 1). On MR scanning the lesion demonstrated hypointense T1, and heterogeneous hyperintesity T2 mass with peripheral hyperintesity and central hypointesity, which likely reflects elements of necrosis and/or hemorrhagic products. Gadolinium enhanced T1-weighted images revealed peripheral enhancement (Figures 2 and 3). Malignant peripheral nerve sheath tumors (MPNST) are a group of neurogenic tumors that may be sporadic or coexist with neurofibromatosis. They originate from peripheral nerves or from cells associated with the nerve sheath, such as Schwann cells or fibroblasts. They are considered rare neoplasm and affect 0.001 percent of the population.1 The epithelioid subtype is more rare and represents a well-recognized entity comprising of about 5 percent of these tumors.2 The clinical behavior of this variant is unclear and raises a completely separate differential diagnosis and is characterized by a predominance of large epithelioid cells. A definitive diagnosis of MPNST is obtained by histopathology and S-100 immunostaining. The epithelioid subtype is more common in superficial sites and in contrast to conventional MPNSTs, expresses S-100 protein strongly and typically, diffusely.3 Our patient’s immunohistochemistry demonstrated S-100 protein positivity and loss of INI1, consistent with EMPNST. Adjacency to a big vessel or nerve trunk makes EMPNST unresectable and recurrence with distant metastasis make this tumor fatal. Therefore, the diagnosis of the EMPNST before surgery is important. Considering the overlap in clinical manifestation, distinguishing EMPNST from benign neurogenic tumor is difficult. Imaging plays an important role in diagnosis of malignant peripheral nerve sheath tumors. Ultrasound features that may suggest malignancy have been studied and these features are not consistent. They cannot be used reliably to differentiate malignant from benign peripheral nerve sheath tumors.7 In our case, the ultrasound examination demonstrated smooth margined a well-circumscribed avascular mass (Figure 1), features that are not suspicious for malignancy. Junji et al examined the MRI features of malignant nerve sheath tumors and concluded that certain MRI features help to distinguish malignant peripheral nerve sheath tumors from neurofibromas. These features have been studied and include: increased largest dimension of the mass, presence of peripheral enhanced pattern, presence of perilesional edema-like zone, and presence of intratumoral cystic lesion.8 They concluded that if a tumor has two or more of these features, the lesion is highly suspicious for malignancy and the lesion should be subjected to biopsy. The epithelioid subtype of malignant peripheral nerve sheath tumor is a rare entity and has not been studied as a separate entity. In our case, one of the features, peripheral enhancement was present (Figure 3). Yu et al. evaluated the radiological features of the malignant nerve sheath tumors and reported peritumoral edema, intratumoral lobulation, and peripheral enhancement are suggestive of malignancy.9 These findings suggest that malignant peripheral nerve sheath tumors may have a wide range of radiological presentation and considering that peripheral enhancement has been consistently reported by different authors and it may be a more common presentation in the malignant peripheral nerve sheath tumor category. In our case, the only feature of malignancy presented by the authors, is the peripheral enhancement (Figure 3). Matsumine et al10 believed that the presence of high signal on T1WI is a diagnostic indicator. The lesion in our case also demonstrates T1 hyperintesity (Figure 2); however, hemorrhage is also seen in Schwannoma and T1 hyperintesity and is likely nonspecific. In summary, EMPNST is a rare tumor that is considered a differential diagnosis for malignant melanoma. Features that favor EMPNST are diffuse S-100 protein expression and INI 1 expression loss. MR features that may suggest malignancy include: increased largest dimension of the mass, presence of peripheral enhanced pattern, presence of perilesional edema-like zone, and presence of intratumoral cystic lesion, intratumoral lobulation. The findings in our case and the prior studies suggest that ultrasound cannot be reliably used to differentiate benign from malignant lesion. Moreover, although MR features of malignancy when present can aid in diagnosing malignant peripheral nerve sheath tumors, these features are not consistent and presence of any of the aforementioned features should be considered as possibility of malignancy and with appropriate work up to be followed. Murphey MD, Smith WS, Smith SE, Kransdorf MJ, Temple HT. From the archives of the AFIP. Imaging of musculoskeletal neurogenic tumors: radiologic–pathologic correlation. Radiographics. 1999;19:1253–1280. Sperandio M, Di Poce I, Ricci A, et al. Malignant peripheral nerve sheath tumour: CT and MRI findings. Case Rep Radiol. 2013;2013:517879. Ueda R, Saito R, Horiguchi T, Nakamura Y, Ichikizai K. Malignant peripheral nerve sheath tumor in the anterior skull base associated with neurofibromatosis type 1. Neurol Med Chir (Tokyo). 2004;44(1):38-42. Levine EA, H. T., Baucus S, Mechetner E, Mera R, Bollinger C, Roninson IB, Das Gupta TK: Evaluation of newer prognostic markers for adult soft tissue sarcomas. J Clin Oncol. 1997;15(10):3249-57. Hollmann TJ, Hornick JL. INI1-deficient tumors: diagnostic features and molecular genetics. Am J Surg Pathol. 2011;35:e47–63. Carter JM, O’Hara C, Dundas G, Gilchrist D, et al. Epithelioid malignant peripheral nerve sheath tumor arising in a schwannoma, in a patient with “neuroblastoma-like” schwannomatosis and a novel germline SMARCB1 mutation. Am J Surg Pathol. 2012 Jan;36(1):154-160. Reynolds DL, Jacobson JA, Inampudi P, Jamadar D, et al. Sonographic Characteristics of Peripheral Nerve Sheath Tumors. Am J Roentgenol. 2004;182(3), 741-744. Wasa J, Nishida Y, Tsukushi S, Shido Y, et al. MRI features in the differentiation of malignant peripheral nerve sheath tumors and neurofibromas. Am J Roentgenol. 2010;194:6, 1568-1574. Yu Y, Wu J, Ye J, Chen M. Radiological findings of malignant peripheral nerve sheath tumor: reports of six cases and review of literature. World Journal of Surgical Oncology. 2016;14(1). Matsumine A, Kusuzaki K, Nakamura T, et al. Differentiation between neurofibromas and malignant peripheral nerve sheath tumors in neurofibromatosis 1 evaluated by MRI. J Cancer Res Clin Oncol. 2009;135(7):891-900. Trout E, Patel A, Golchian D. Epithelioid malignant peripheral nerve sheath tumor. Appl Radiol. 2018;47(2):24-26. Prepared by Dr. Trout while a Staff Radiologist at the University of Iowa Hospitals and Clinics in Iowa City, IA; Dr. Patel while a Radiology Resident, PY-V, and Dr. Golchian while a Radiology Resident, PGY–II at Beaumont Hospital, Dearborn MI.